What's this? This is a list of the Dog-Play Shops and how I've set them up. It's for me. I suppose I could have hidden the page, but what the heck, I've nothing to hide. Yeah Yeah I know that some people worry about someone copying their keywords. I don't worry. Copy away. Looking at how others used keywords is how I learned. Meta-Tag Description: Success begins with trying. This poster style graphic shows a dog (Oso) mastering the agility a-frame. Description Text: Success Begins With Trying. This is an apt slogan even if you aren't an agility addict. Agility is a good demonstration of this principle.It takes some effort to succeed, instinct alone won't cut it. Agility Excuses: Are you doing it wrong? Shop Name: Agility Excuses: Are you doing it wrong? Title Agility Excuses: Are you doing it wrong? Meta-Tag Description: The joy of jumping and a bit of agility philosophy comes with a smile on these shirts, mugs and other things. Dogs having fun is our theme. Agility Excuses: Are you having fun? 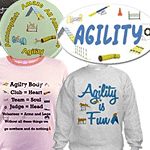 Shop Name: Agility Excuses: Are you havng fun? Title Agility Excuses: Are you havng fun? Description Text: Agility is fun. So is the message carried on these clothes. From cool weather to warm you will find the right top to share your sense of agility humor. Meta-Tag Description: The joy of weaving and a bit of agility philosophy comes with a smile on these shirts, mugs and other things. Dogs having fun is our theme. 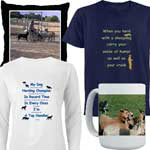 Meta-Tag Description: The joy of agility with your dog shows on these shirts, hats, sweats, mugs and more. Haven't Q'd lately? Oh well. Dogs having fun is our theme. Meta-Tag Description: The joy of climbing the a-frame and a bit of agility philosophy comes with a smile on these shirts, mugs and other things. Dogs having fun is our theme. Description Text: Agility for Dog-Play is 100% owned and operated by an individual to promote improved relationships with our dogs. These are just some of the selections. It's more than just T-shirts. Meta-Tag Description: Herding is a very interesting activity to do with your herding dog. It's very interesting to see the genetic behaviors emerge. Description Text: Herding with your dog can be an awsome experience. These products reflect the special working relationship involved. Meta-Tag Description: Herding dog art. This graphic is my McNab mix Tsuki approaching a couple of curious sheep. Meta-Tag Description: My dog would have been herding champion except that I froze in record time and sent my dog the wrong way in every class because I'm definitely not a top handler. Meta-Tag Description: My dog would have been herding dog champion if only cattle weren't so big and scary, ducks weren't so easy to step on, and sheep weren't so much fun to chase. Description Text: Herding with your dog can be an awsome experience. These products reflect the special working relationship involved. This graphics explains My dog would have been herding dog champion if only cattle weren't so big and scary, ducks weren't so easy to step on, and sheep weren't so much fun to chase. Meta-Tag Description: Herding involves an interesting 3-way relationship between dog, stock and handler. My graphics capture that dynamic on mugs, t-shirts and more! Description Text: Herding, agility, carting and therapy are but some of the wonderful activities we can do with our dogs. These graphics are intended to keep us on the lighter side when engaging in dog sports. They are very popular because they make people smile.